Lotus Mahal is the item of attraction in Zenana Enclosure. Usually tourists see the palace and move on to the Elephant Stables. But tourists who patiently look around find more than just the Mahal. 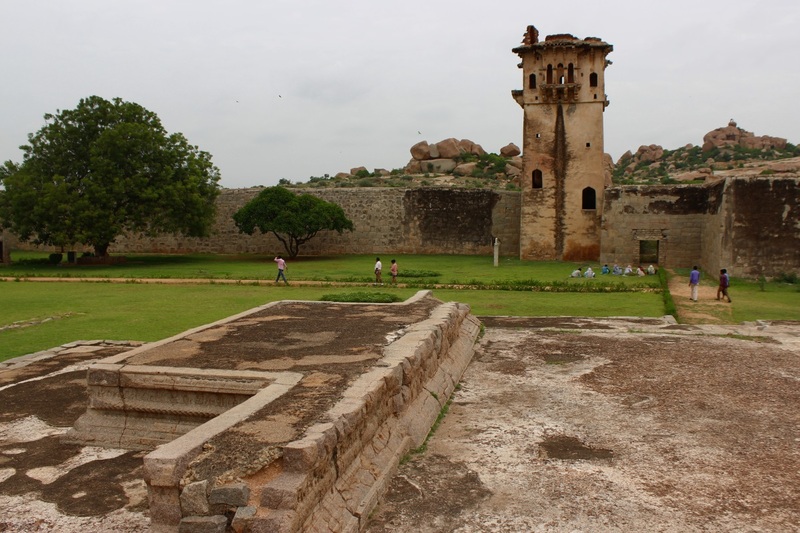 Within the enclosure are the following- two water tanks or pools, a palace pedestal, watch towers and the treasury building. 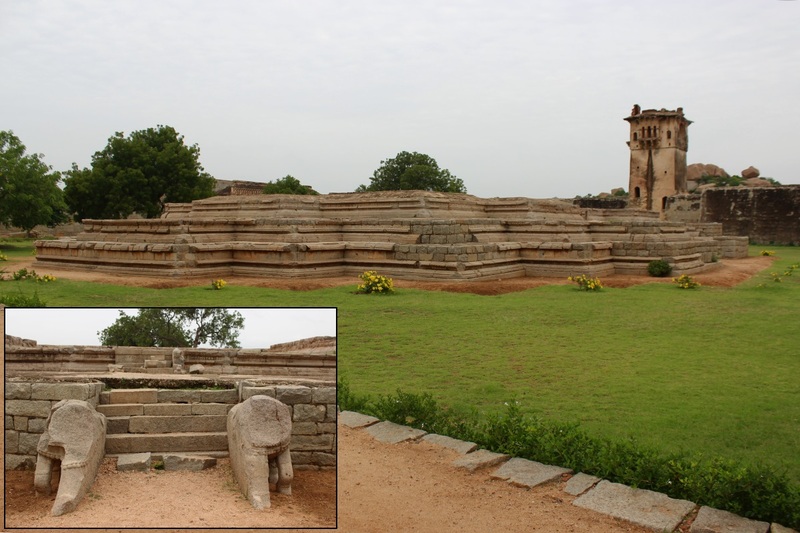 The palace pedestal is what remains of another palace which stood here once upon a time which would have been slightly larger than the Kamal Mahal. The two water tanks are simple constructions ..stone lined pits. The palace is north facing. The north entrance steps are flanked by two damaged stone elephants ..image the grandeur in its original condition. View from the platform. The walls are made of stones and lime mortar; the outer surface consists of sculpted stone blocks and the gap is filled with earth and lime mortar. 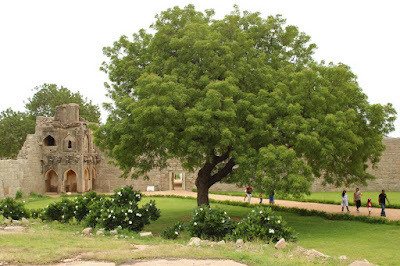 I'm guessing the open space would be covered with flower and fruit bearing trees ..now we have only Neem trees. View of the palace from the western side. 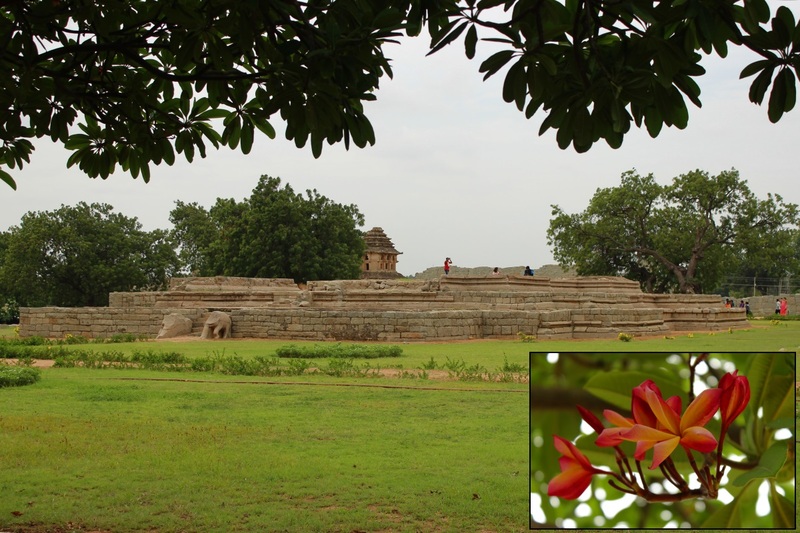 This picture was shot from the shade of a red-orange Frangipani trees. The flowers are fragrant and mix of warm colors ..red, yellow, orange (see inset). The two palaces and two water tanks are positioned diagonally opposite so that both palaces are kind of equidistant to the tanks. This tank is more like a swimming pool. 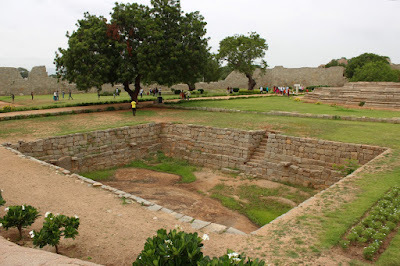 Besides the pool is a granite mound ..from where this picture was shot. From the same point, I turned around to get a glimpse of the elephant stables. The enclosure walls are at the lowest here and small watch tower on the eastern wall. Panning little to the right is a beautiful Neem tree. The caretakers have planted lot of White Frangipani cuttings ..Neem and Frangipani thrive in Hampi's rocky terrain. Two very ols Neem trees, probably close to 100 years. In the northwest corner of the enclosure is an ancient structure known as the Treasury Building. Currently it is a museum of paintings and sculptures. 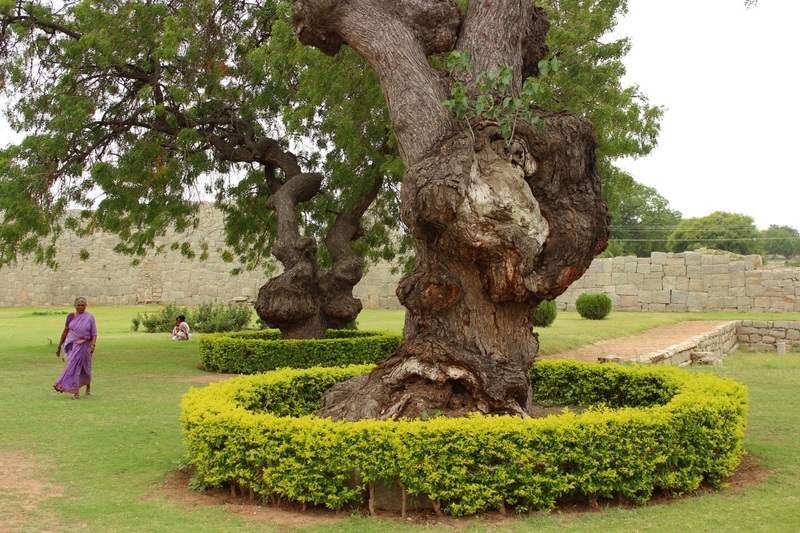 Among the items is Vijayanagara family tree. 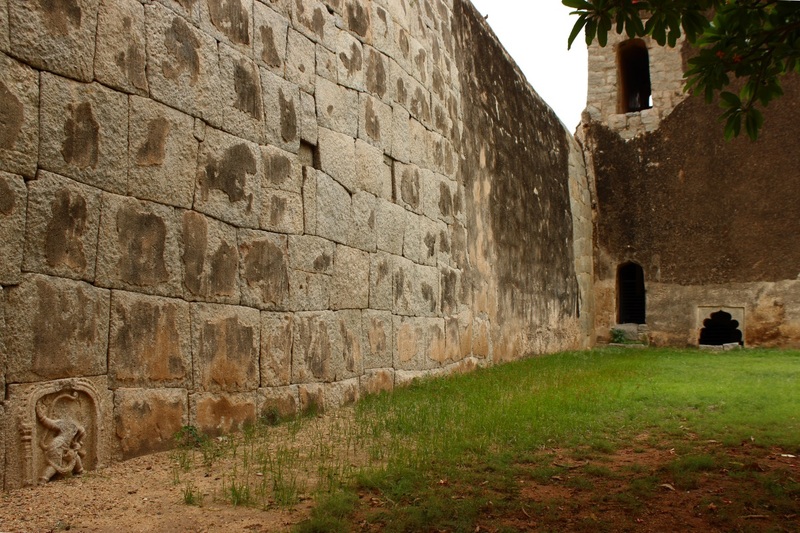 The high walls and tall watch towers explains the reason for security. 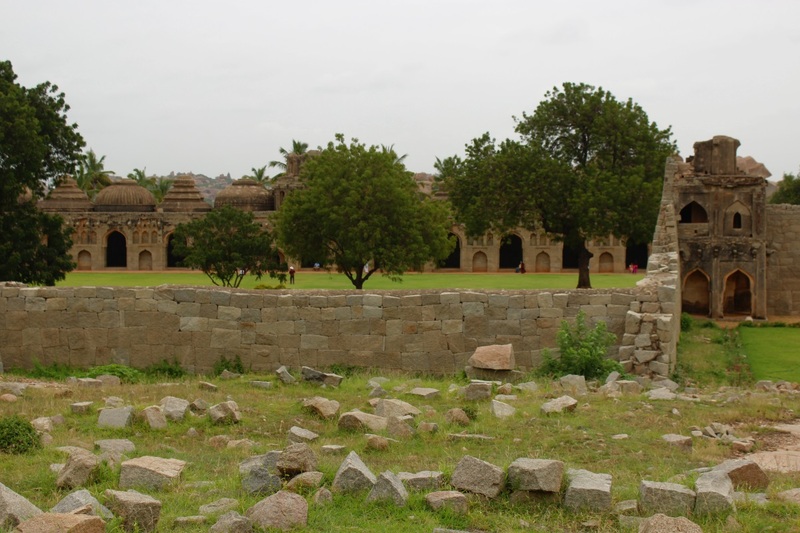 The rulers had the palaces built so that they could remain close to their movable wealth. 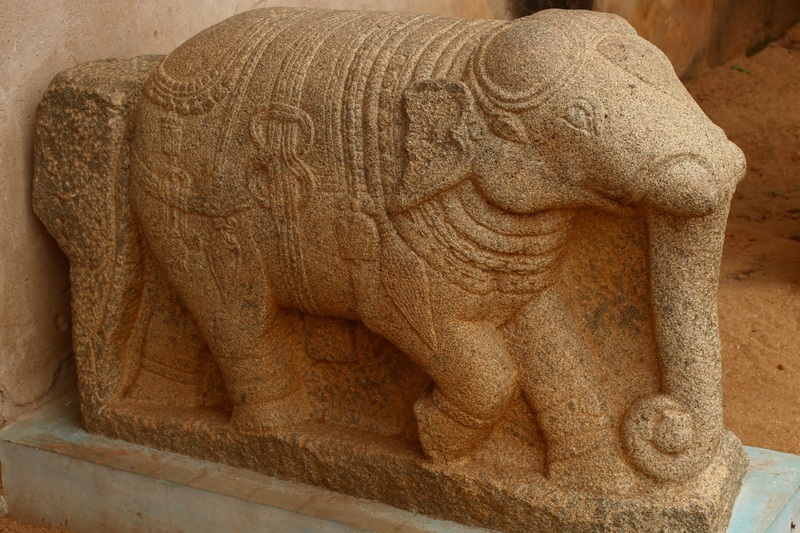 Among the sculptures is a well preserved elephant about 2' tall. It is decorated with jewelry befitting a royal elephant. 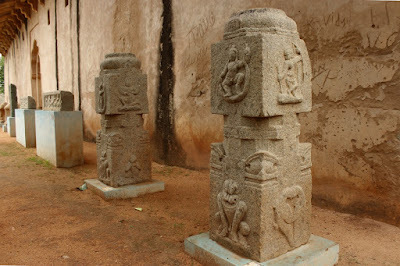 Hampi was known for its markets. Areas were marked for different types of precious commodities like precious metals and stones, expensive fabric, exotic food and spices, etc. 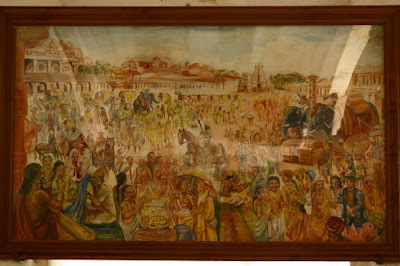 I remember visiting four markets- Virupaksha Bazar, Pan Supari Bazar, Krishna Market and Soolai Bazar. It is said that jewelry and gems were sold in open baskets.. the markets were so secure. Below is a artistic depiction of one of the markets. The north east wall where it touches the watch tower. A sculpture of Lor Hanuman is embedded into the wall to signify its strength. If you look at the watch tower base, it has an opening, probably to an exit for rain water.